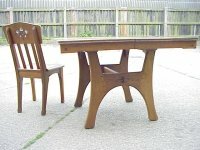 A French Arts and Crafts oak extending dining table with two extra leaves and six matching dining chairs designed by Leon Jallot. The last two images are from 'Arts and Crafts' by Judith Millar. Page 63. Where a set of six chairs are valued at �00 to �,000 and a Buffet is also valued at �00 to �,000. 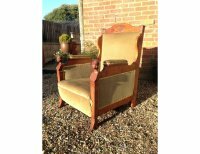 A stylish and intricately detailed Walnut armchair with carved female heads to the arms and inlaid and carved details. 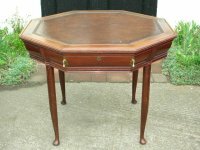 A well designed octagonal continental Library table in the style of Henry Vandevelde with original inset leather top and two drawers with stylised brass handles and escutcheons. 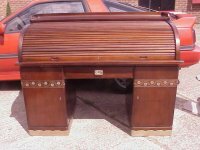 Two Arts and Crafts oak piano stools designed by Wilhelm Schmidt and made by Prag-Rudniker, in Vienna. 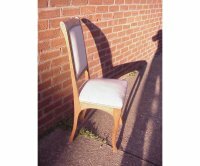 One with original fabric and Tulip style cut-outs to the top with three slats to each side and lower twin stretchers. A cane seat version of this stool. There was an identical version with cane seat for sale in Germany at Von Zezschwitz on the 30th June 2011 with an estimate of 1800 Euros. 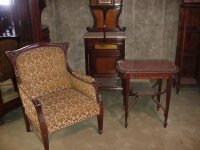 A pair of continental oak bedside cabinets and another similar one, with marble tops and extending shelves to each side. Height 33" Width 22 1/2", Depth 16". Circa 1900. 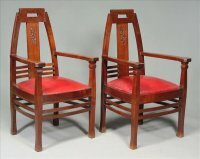 Peter Berhens, a pair of Jugendstil mahogany armchairs, the seats re-upholstered in red leather, 110cm high See Whiteway, Michael and Gere, Charlotte 'Nineteenth-Century Design From Pugin to Mackintosh' London 1993, p. 262, plate 333 for a side chair of a similar pattern. Gustave Serrurier-Bovy. 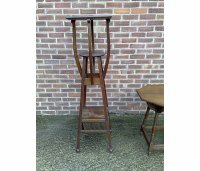 A rare and important oak Art Nouveau plant of impressive proportions designed by Gustave Serrurier-Bovy one of his very first plant stand designs. Height 58", Width 16", Depth 16". Circa 1900. 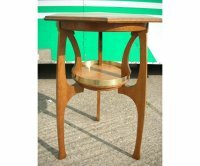 An oak Successionist side table with octagonal top and brass bound circular lower shelf in the style of Gustave Serrurier-Bovy. 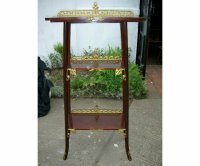 Height 31 1/2", Width 19", Depth 19 ", Width of brass bound lower shelf 12". Circa 1900. A Continental Aesthetic Movement scissor action drop leaf side table with a Hungarian ash top and Ebonised under carridge with elongated turned spindles and tramline details. 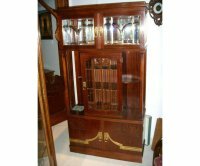 An Art Nouveau Mahogany display cabinet with sinious carved floral details, shaped drawers and wonderful gilt metalwork with adjustable glass shelves. Height 97 1/2", Depth 27", Width 50". Circa 1900. 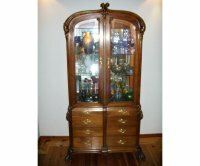 A Secessionist mahogany display cabinet with two bevelled glass doors, stylised floral carvings and four open display shelves with a double cupboard to the base, further stylised floral carvings to the doors with stylised brass handles and hinges. Height 69 3/4", Width 38 1/2, Depth 15 1/2". Circa 1900. Leon Benouville. 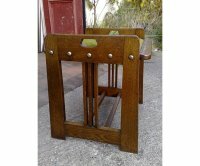 An Art Nouveau oak desk/side chair designed by Leon Benouville 1903. 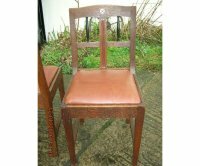 A pair of French Art Nouveau oak chairs. 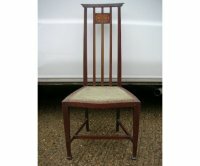 These have been knocked apart joints cleaned, re-glued assembled and clamped, cleaned and waxed and professionally re-upholstered in a quality burgundy hide. 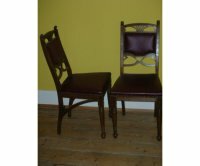 A good quality pair of Secessionist style oak side chairs with ivory and ebony stylised inlays, ebony spindles. Professionally upholstered in a quality leather. 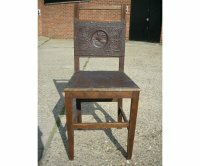 An Art Nouveau side chair with an Art Nouveau maiden head centered in a stylised floral embossed seat and back rest. 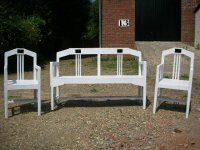 A secessionist three seater bench with a matching pair of armchairs. These have been gently knocked apart, joints cleaned, re-glued and clamped. Hand stripped as the original paint had flaked off now undercoated ready for a top coat which could be to the colour of your choice. Could be painted to be used outside. 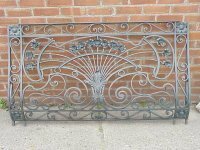 A good quality period Art Nouveau wrought iron balcony. 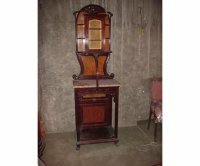 A good quality Sucessionist style Walnut corner cabinet, bevelled glass door with drawer below and an open display area below with five legs on shaped feet. Height 73", Width across the front 27", Depth from side to back 19 1/2" each side. Circa 1905. 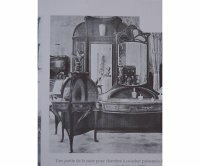 Louis Majorelle - Art Nouveau wardobe, cabinet, desk, sidetable and armchair, almost identical to the suite he exhibited at the 1901 Paris Exposition which is shown in the 1st image. 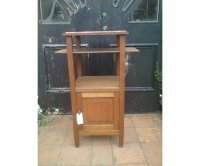 The wardrobe, desk, sidetable, armchair and folding mirror have been SOLD*. Only the cabinet CF 22LM below remains. Louis Majorelle - An Art Nouveau cabinet, with stylised floral carved details to the crown with a central glazed cupboard with bevelled glass doors flanked by three shelves to each side with a lower central carved support fixed below a white marble area to a further carved frieze and Art Nouveau inlaid peacock style scroll details on Maple veneers behind with a waist shape back with carved leaf detail terminating in carved blooming florets, a lower display area with an almost conforming Maple inlaid back and standing on carved cabriole legs. Modelled on an almost identical suite he exhibited at the 1901 Paris Exposition. Height 203cm, Width 63.5cm wide, Depth 42.cm. Circa 1900. 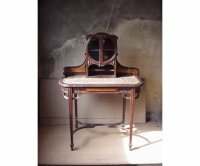 Louis Majorelle - An Art Nouveau writing desk, with wonderful stylised floral carved details to the central glazed circular cupboard with bevelled glass doors with a small shelf below, the sweeping back inset with Maple veneers with a generous writing area and drawer below with conforming inset Maple veneers and organic whiplash supports below to the front and to the sides and further whiplash Art Nouveau stretchers with the elegant tapering carved legs terminating on small organic bud like details. Modelled on an almost identical suite he exhibited at the 1901 Paris Exposition. Height 122.5cm, Width 91.5cm wide, Depth 52.5cm. Circa 1900. 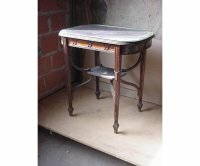 Louis Majorelle - An Art Nouveau 'D' end sidetable with organic Art Nouveau upper and lower supports united by a central tier and to the four elegant tapering carved legs terminating on small organic bud like details. Modelled on an almost identical suite he exhibited at the 1901 Paris Exposition. 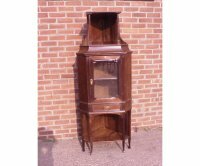 The wardrobe and folding mirror have been sold. Louis Majorelle - An Art Nouveau Armchair of generous proportions with with wonderful stylised floral carved details to the upper ears and a superb lower stretcher uniting the elegant tapering carved legs terminating on small organic bud like details. Modelled on an almost identical suite he exhibited at the 1901 Paris Exposition. 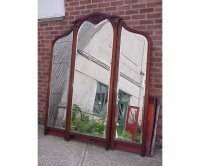 Louis Majorelle - An Art Nouveau folding mirror, with wonderful stylised floral carved details to the crown. Modelled on an almost identical suite he exhibited at the 1901 Paris Exposition. 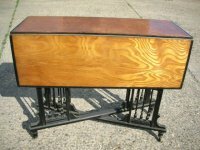 A high quality Secessionist desk in the style of Otto Wagner. 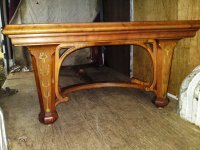 An Exhibition Art Nouveau snooker table designed by Emile Hurtre, made in Paris. 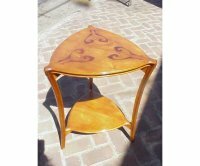 Nancy School, a French Art Nouveau cherry and inlaid two-tier table, triform with moulded and curved supports. Height 30" 77cm, Width 23" 57cm, Depth 23" 57cm. 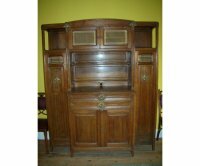 An Arts and Crafts oak sideboard designed and made by Mathieu Gallerey, he exhibited next to Galle' in the 1906 Les Decorative Arts in Paris. It's from The Roses dining suite. Measures approx 6' 6" tall by 5'wide. Circa 1910. 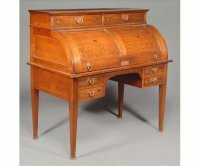 A Secessionist oak and inlaid cylinder desk, with copper handles, cut-out roundels and ebony and mother of pearl stylised flowerheads, stamped on several drawers 'GLASGOW', 124cm high, 125cm wide, 70cm deep. 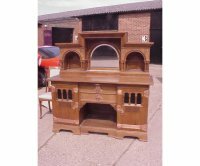 An Arts and Crafts oak sideboard with engraved copper metalwork, crisply cut stylised floral carvings and green glass behind Roman style arches. An Art Nouveau what not with organic gilt brass mounts. Height 58 1/2", Width 22 1/2", Depth 12". Circa 1900. 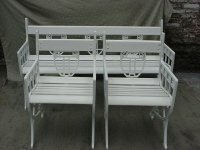 A pair of successionist cast iron garden seats with a matching four seater bench.